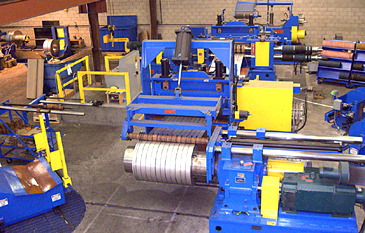 Los Angeles, CA - Globe Stainless, Inc., a high-quality flat rolled stainless steel distributor and coil processor, has installed a precision high-performance Braner/Loopco Single-Loop Turret Head™ Slitting and Slit Coil Packaging Line in its Los Angeles facility. 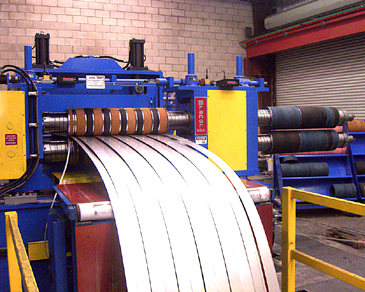 Globe Stainless' high-performance slitting line has the capacity to efficiently convert 60" wide 300 and 400 series stainless steel coil in all finishes into precise width straight-wall PVC laminated or paper interleaved slit coil.. Gauge capacity is from .015" minimum through .187". A single-loop mode or either of two (2) tight-line operating modes can be employed, depending upon coil specs and slitting load. A floor level Coil Car with a "wireless" operator control loads coils onto the Uncoiler. 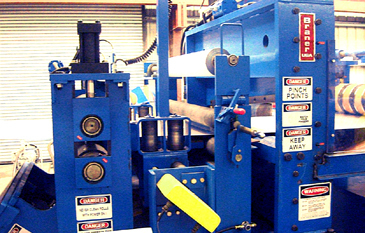 Paper interleaved between coil wraps is handled by a hi-torque Paper Rewinder. 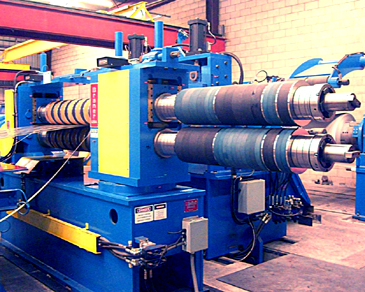 A non-contact hydraulic servo Edge Guide precisely aligns the coil edge into the Slitter at all line speeds. Pushbutton adjustable Roller Guides with electronic position readouts make coil threading and tail-out quick and efficient. 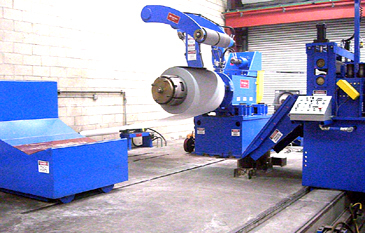 A PVC Applicator laminates surface protection PVC film onto the incoming strip, and a Hydraulic Guillotine Shear crops coil heads and tails and collects the scrap in a Scrap Car for easy disposal. The Globe Stainless Slitting Line features a quick-change Turret Head™ Slitter that generates precise tolerance slit strips with minimum burr throughout the entire range of gauge and mechanical properties. A variable speed Slitter drive allows Globe Stainless to process gauges to .105" in the single-loop mode. Two (2) quick-change heads are mounted in a rotatable turret supported on a precision ring bearing that assures accurate arbor alignment and effortless head change in one-minute. The slitter head at the "set-up" station is open and accessible with no housings, bases, or other impediments to slow re-tooling for the next order. Fast re-tooling and quick head change ability allows Turret Head™ Slitter users to process more orders per shift than with any other multi-head slitter or tooling transfer device. Globe Stainless' Slitter is equipped with Braner/Loopco's new "threadless" tooling lock nuts. The new lock nuts are engaged in 1/4-turn and completely eliminates arbor and lock nut thread maintenance.